Automatic rotary type measuring cup placement machine is dedicated in placement of measuring cup on the bottles that is widely used in industries like pharmaceutical, food, dairy, beverages etc. 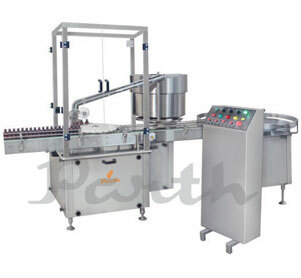 Measuring cup placement machine made by Parth Engineers & Consultant is enclosed in a stainless steel body that consists of conveyor belt, measuring cup feeding & pressing unit. The measuring cup is been placed on the sealed bottles with the help of feeding unit and is further moved with the help of the conveyor. Our measuring cup placing machine is user friendly and can handle bottles of various size & shapes.